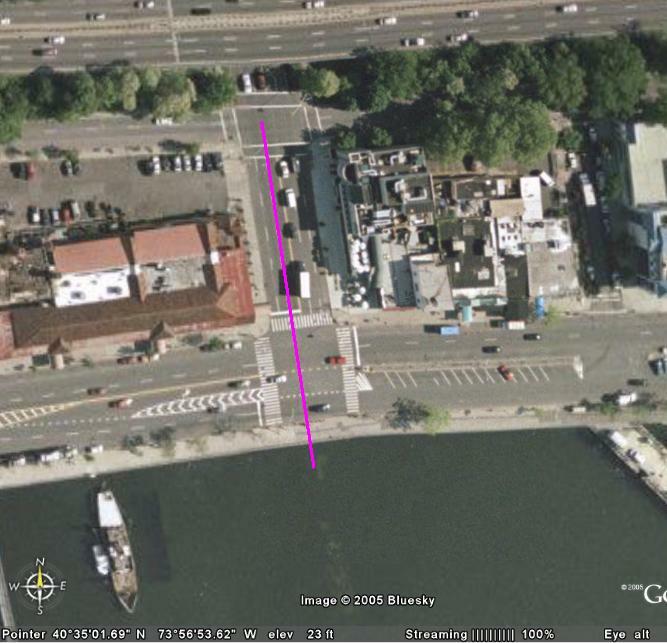 Note how the street spills out onto the beach, which lacks a sufficient incline to qualify as a wall for an eruv. 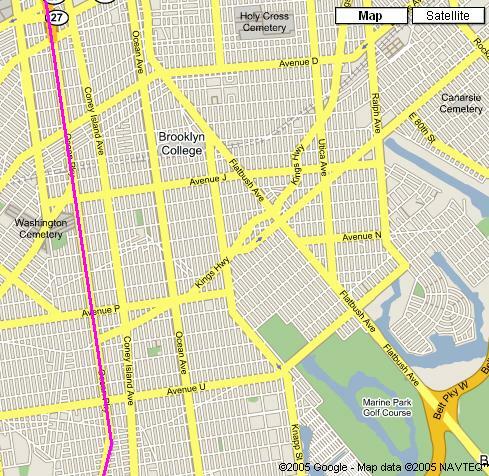 Below are maps of Ocean Parkway. 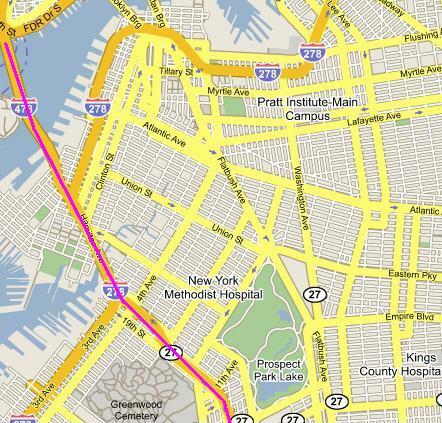 The street starts off as the BQE/Gowanis Parkway that connect to the Brooklyn Battery Tunnel and the Brooklyn Bridge. The Gowanis Parkway connects to the Prospect Expressway which turns into Ocean Parkway. 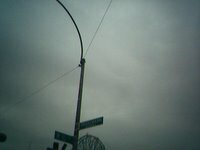 Ocean Parkway continues until the end of Brooklyn and then curves into Surf Ave. Surf Ave. has a number of outlets onto the boardwalk. 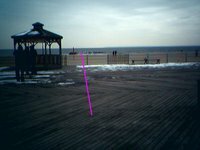 The boardwalk itself is not a valid wall and opens up onto the beach, which is also not a valid wall. The above is from Google Maps. 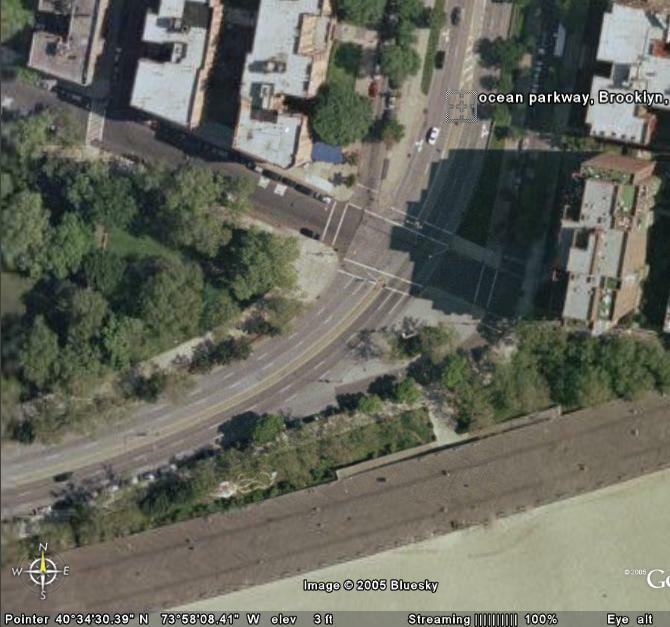 The pictures below, of Ocean Parkway curving and then outlets going to the boardwalk, are from Google Earth. 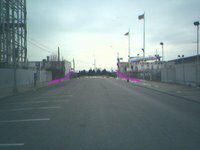 I drove out to one of those outlets this past Sunday and took some pictures with my cellphone camera. This is of Dewey Albert Place, West 10th St. Here is the street as it looks about halfway down from its intersection with Surf Ave. 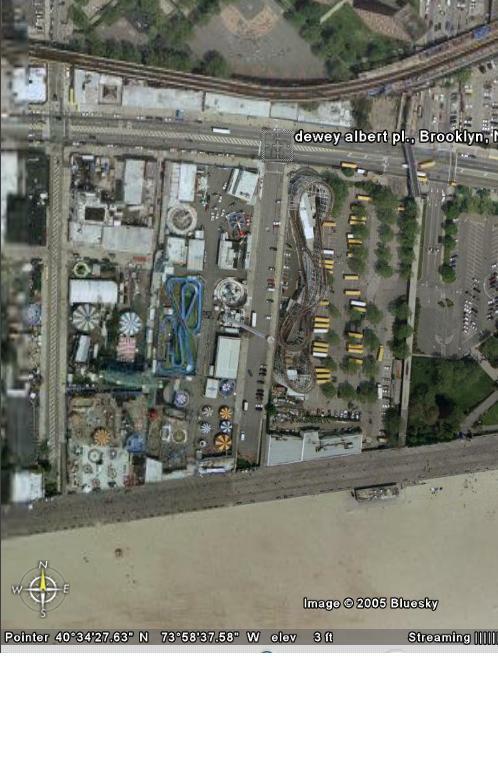 Note the two ramps that go up to the boardwalk. 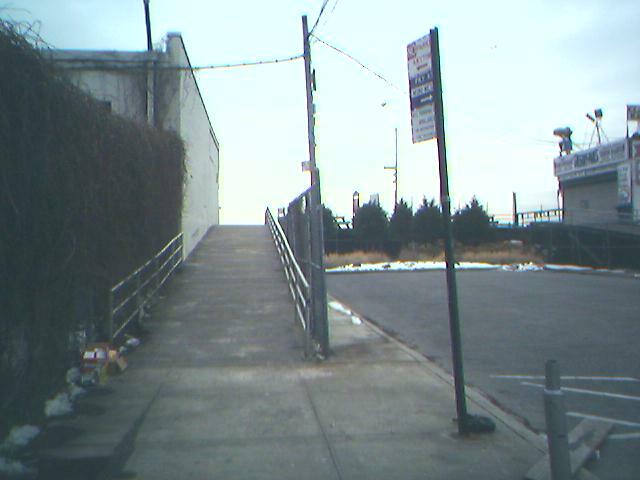 Their incline is not steep enough to stop the "street" from continuing up onto the boardwalk. Here is the ramp on the left. 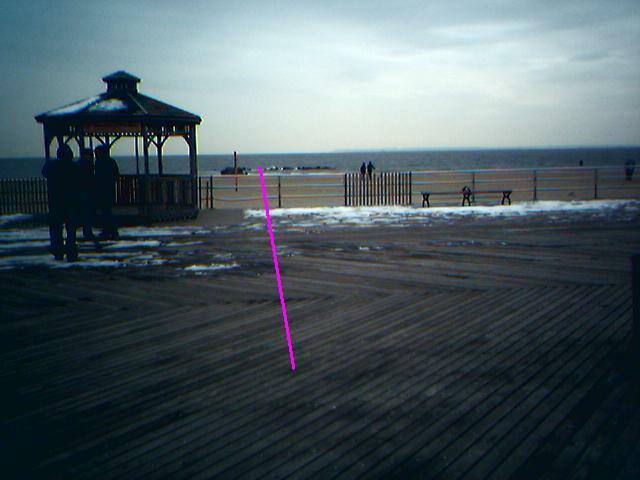 Here is what it looks like up on the boardwalk. Note that the gate does not qualify as a wall and there is no incline on the beach, so the "street" continues straight out into the ocean. 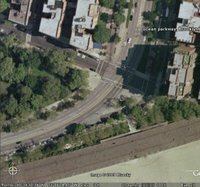 If one allows significantly curving streets to still make eruvin impossible, as some posekim do, then Ocean Parkway should qualify. 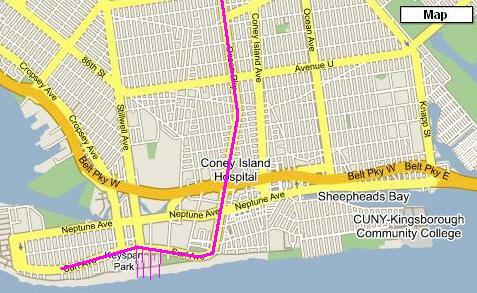 It goes from one end of Brooklyn to the other, from a tunnel and bridge to the boardwalk and beach. 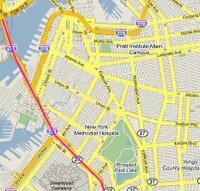 According to these authorities, in order to build an eruv in Brooklyn one would have to close off the outlets onto the beach with a wall. This is, of course, not lost on the pro-eruv rabbis. Here is how they solved the problem. This is a lamppost on the boardwalk, at the corner of W. 10th St. and Riegelmann Boardwalk. 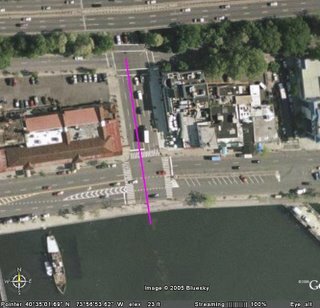 And there is the tzuras ha-pesah that is supposed to enclose the street from continuing into the ocean. Whether this is sufficient to qualify as a wall for this purpose will God-willing be discussed in a future post.